During my pampering experience at the Shiseido Penthouse event a couple of months ago and makeover was part of the "pampering sesh". When the makeup artist was ready to curl and apply mascara, I immediately blurted out a disclaimer: "Sorry, I don't think you can do anything with my lashes!" And he went: "Oh yeah, you have very sparse lashes!" (OUCH!) "But, let's try this Full Lash Volume Mascara that may work wonder!" Then the rest was history, I obviously loved the effect so much I went on and got one for myself! As simple as a black packaging, Shiseido made a uniquely designed mascara tube making it look oh-so-gorgeous on my vanity table! The wand is just perfect for my eyes, not too big nor too small! And the curve fits the "curve" of my eye just like the Shiseido Lash Curler. But obviously, I can't stop there, I actually tried this mascara for a month and I'm finally ready to share my thoughts. Mascara wand is perfect especially for users with small eye shape. Does not create "crunchy" or stiff lashes. Lash curl stays on the whole day. Adds length and a bit of volume! Each lashes look glossy and not dry at all. A pricey mascara but worth it if you needed the extra oomph! A great lengthening mascara that coats each lash strand making the lashes appear more defined and a tad bit fuller. Curl lashes before mascara application. Always apply mascara starting from the roots to the tips. Try not to apply too many layers of mascara as it may weigh down your lash hairs. Use the curved portion of the mascara wand and wiggle it starting from roots to tips. Using the "outer curved portion", gently add on 2nd and 3rd layer. If you accidentally touched mascara wand on lid, fret not, let it dry and you can easily remove it with your fingernails. Short, sparse lashes can use this and you will see better-looking lashes in no time. 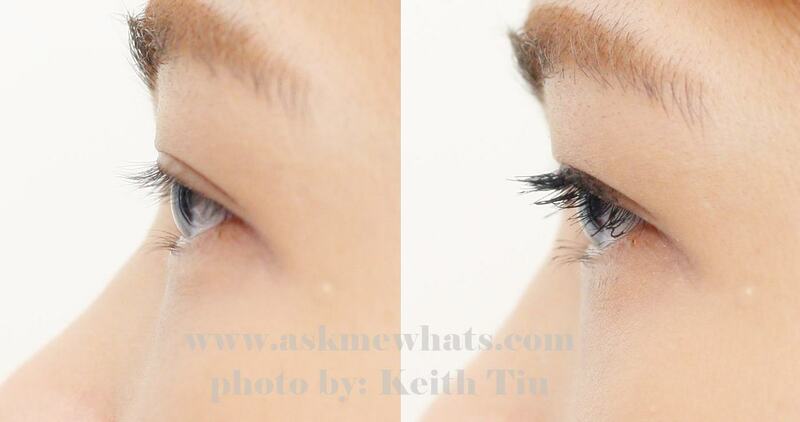 A closer look on the "glossy" mascara texture. It can easily coat every lash strand without drying. Application technique: Always start at the roots and wiggle your way up! No matter how many layers you plan to apply, always start from the roots to the tips to prevent weighed down lashes. A more defined eye. It looks like I had liner on! And I don't have to worry about the mascara "mess" on my lid area as I just wait for it to try and gently remove it with clean cotton bud or cotton bud soaked with oil-free eye makeup remover. See how much length this mascara gives? No clumping by the way! I applied this mascara without curling my lashes to see if this mascara has a natural "curling effect". It obviously doesn't have that but I don't mind the extra step of curling my lashes if my lashes will look this LONG! Will you pay premium for mascara to do the job? I usually say NO, but in my field of work, I don't mind spending extra for my clients just for them to get the best! I want this look. I will try this at home. Thanks for sharing. Nikki, Thanks for the help!